Israel's attorney general intends to indict Prime Minister Benjamin Netanyahu on corruption charges. Mr Netanyahu, who faces an election, said in a TV address that the case would "collapse like a house of cards". In a defiant broadcast, he repeated his assertion that he is the victim of a left-wing "witch-hunt" intended to topple him ahead of the closely contested election on 9 April. Is Israeli PM in more trouble now than ever before? A final hearing, probably after the election, will determine whether the charges go forward. The prime minister will have an opportunity to make his case then. What are the possible charges? Mr Netanyahu is set to be charged with fraud and breach of trust for accepting expensive gifts - including cigars, pink champagne and jewellery worth $264,100 (£199,200) - from an Israeli-born Hollywood film producer Arnon Milchan and the Australian billionaire James Packer. The gifts from Mr Milchan are alleged to have been in return for help with a US visa and tax breaks. Mr Milchan and Mr Packer face no charges and have denied any wrongdoing. In two other cases, Mr Netanyahu is accused of trying to get more favourable press coverage for himself. Attorney General Avichai Mandelblit says he is considering charges of fraud and breach of trust in both, and bribery in one of them. The most serious case is seen as that involving media mogul Shaul Elovitch, controller of Israel's largest telecom company, Bezeq. Mr Netanyahu is accused of seeking favourable coverage from an Elovitch-owned news site in return for regulatory decisions that would benefit the media mogul. Mr Elovitch, himself facing legal proceedings, has strongly denied any wrongdoing. Opposition parties have said there is no way Mr Netanyahu should carry on as prime minister if he is charged. Mr Mandelblit has said the Supreme Court will determine whether he must resign. In his address, Mr Netanyahu said: "The left knows it cannot beat us at the polling booth, so for the past three years they have been carrying out an unprecedented witch hunt which has one aim - to topple the right-wing government which I lead." Earlier, his Likud party said the prospect of charges amounted to "political persecution". What kind of impact could the charges have? It could be significant, especially as Mr Netanyahu already heads a fragile coalition. He and his right-wing Likud party face a serious challenge in the elections from a newly-announced centrist alliance led by ex-army chief Benny Gantz and TV journalist-turned-politician Yair Lapid. And recent polls suggest Likud could lose support and the ability to form a coalition if charges are levelled against the prime minister. Mr Netanyahu has also come under fire this week for attempting to shore up votes by negotiating a merger of the religious pro-settlement Jewish Home party with the ultra-right Jewish Power party, which includes followers of the late anti-Arab extremist rabbi Meir Kahane. Two powerful pro-Israel lobby groups in the US, Aipac and the American Jewish Committee, made rare criticism of Mr Netanyahu's move, describing Jewish Power as a "racist and reprehensible party". 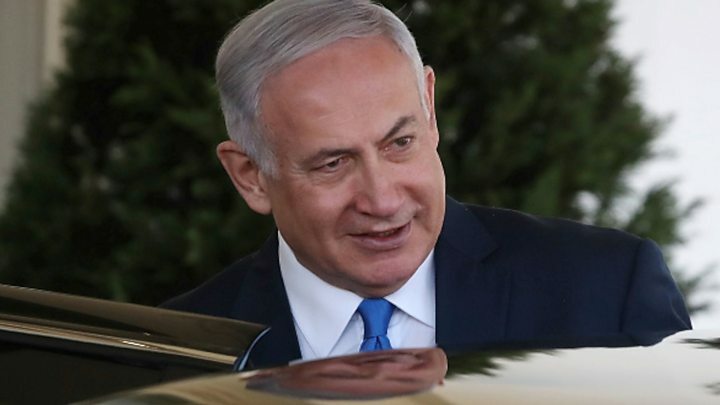 Benjamin Netanyahu had hoped to make history this year - if he stays in office he's set to become Israel's longest-serving prime minister. But he's now also a step closer to becoming the first sitting prime minister to be charged with criminal offences. His Likud party made last-ditch efforts to block publication of this decision at the High Court, arguing it could have a big impact on April's election, but the move was rejected. Mr Netanyahu is presumed innocent unless proven otherwise and there is currently no legal barrier to stop him staying in office if he's re-elected - even if the attorney general makes a final decision to charge him after a hearing due in the coming months. However, many will question the prime minister's ability to handle affairs of state if he's simultaneously defending himself in court.